Bardejov was a free royal town, and because of this status Jews were barred from settling here for centuries. An organized Jewish community was established only in the early 1800s. The community soon constructed a large Jewish communal compound situated outside the town walls. This included the Old Synagogue, a Beit Midrash (study house) and a Mikvah (ritual bath). The Jewish community was strictly orthodox and included many followers of the Hassidic movement. It chose its rabbis from the prominent Halberstamm Hassidic dynasty. In 1940 some 2,441 Jews lived in Bardejov, making up nearly 29 percent of the local population. The town had two synagogues, a mikvah, two Jewish schools, five prayer halls, five charitable associations and two printing houses. The Jewish community was destroyed in the Holocaust, and no Jews live in Bardejov today. The Bikur Cholim Synagogue was established 1929 by the Chevra Bikur Cholim, a Jewish charitable association. Located in the historic city center, it is a simple building; the street façade features two tall, pointed windows and the name of the association written in Hebrew. 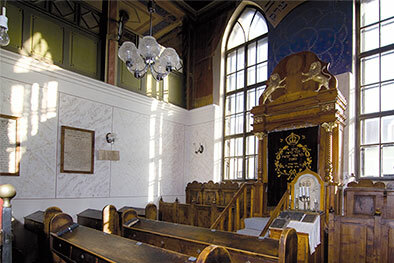 Thanks to decades of care and maintenance by the late Mr. Maximilián Špíra, the sanctuary with its original furnishings is fully intact, making it one of the best preserved synagogues in Slovakia. Though no longer used as a Jewish house of worship, it is maintained by the Central Union of Jewish Religious Communities in Slovakia (ÚZŽNO) as a priceless cultural and historical monument, a silent memorial to a once flourishing community.